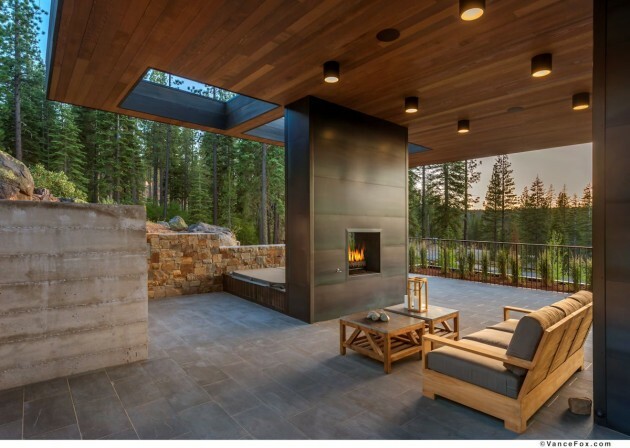 Blaze Makoid Architecture have designed a single family home as part of the Martis Camp developement in Truckee, California. 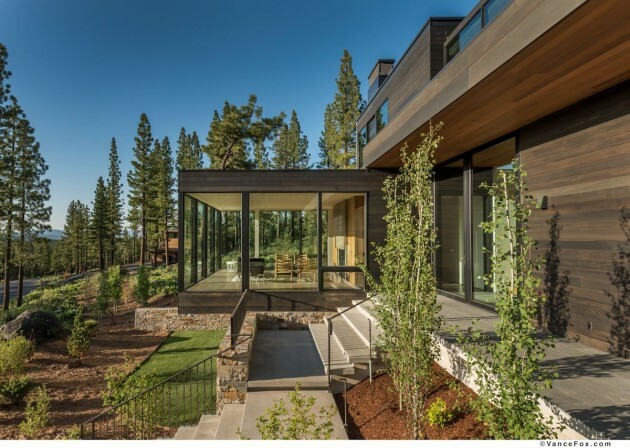 Martis Camp is a 2,200 acre multigenerational ski and golf club located between historic Truckee, California, and Lake Tahoe. Over 600 one to five acre single family lots are planned with small groups of lots being released at a time. 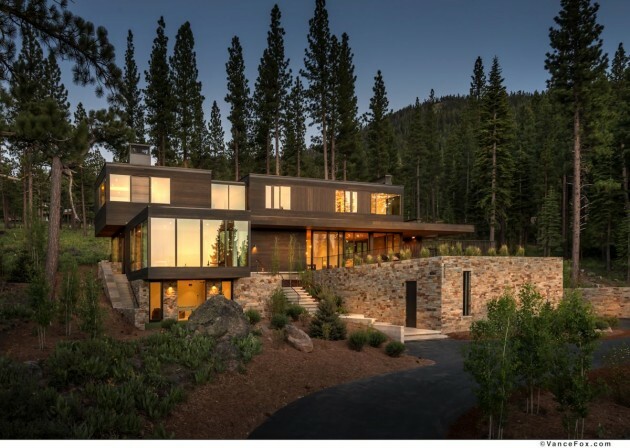 This 6,000 square foot development project is sited on an acre of steeply sloping, wooded terrain, with phenomenal views of the Carson mountain range to the north and west. The placement and footprint of the house preserves the natural site features through minimal grading and tree removal. Accessed from the lower part of the site, the house is a simple ‘L’, with the two wings linked by the double height glazed entry and stair hall, located at the intersection of the two geometries. A stone plinth mediates the steep pitch of the site creating both a cloistered parking court as well as a base on which the two story house rests. High stone retaining walls along the high point of the site combine with a dramatically cantilevered roof to provide extensive, sheltered outdoor patio space that includes outdoor cooking, dining and living areas. These program elements surround the open plan great room that contains living, dining and kitchen. 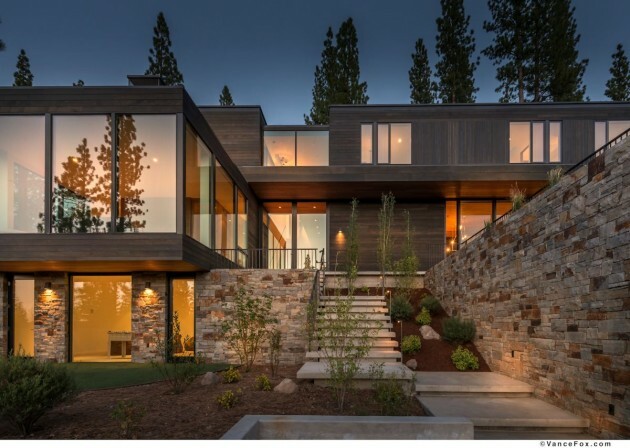 The den to the northwest projects out beyond the stone base, creating a secluded, glazed refuge and serves as a balance to the roof projection on the opposite side of the house. 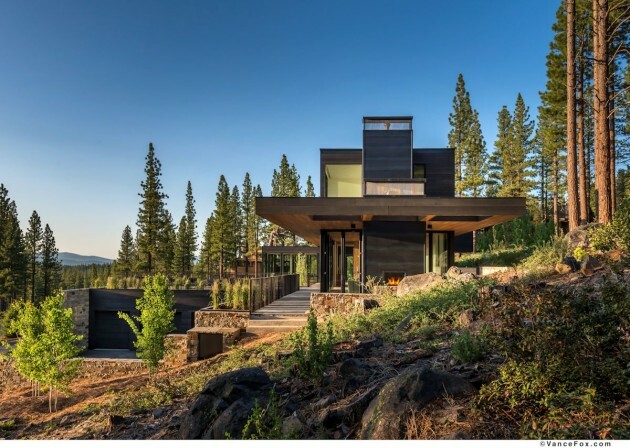 Black stained cedar siding will allow for the house to blend with the landscape during the summer and fall and pose as a dramatic counterpoint to the snow cover through the winter months. 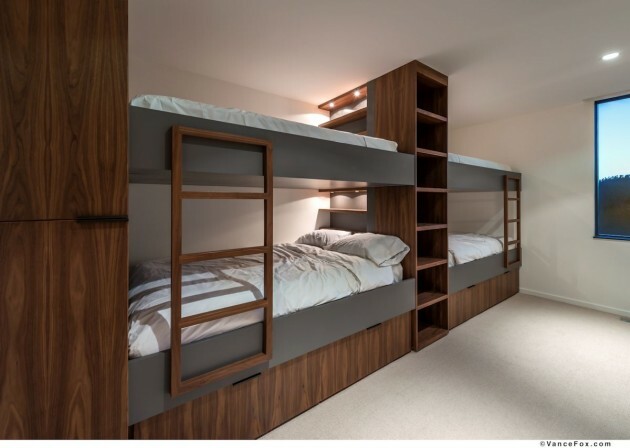 This speculative project is being produced in partnership with the developer and is planned for completion spring 2014.